Hypoxia and algal blooms are common problems in the upper and middle parts of the Neuse River Estuary in North Carolina. In the past four decades, rapid growth around the watershed has resulted in the conversion of forests into agricultural and urban landscapes, as well as a rise in wastewater discharge. These changes have increased the amount of nutrients, particularly nitrogen and phosphorus, in the estuary — what scientists call anthropogenic nutrient loading. While hypoxia and algal blooms can occur naturally, anthropogenic nutrient loading has been shown to intensify these phenomena in many coastal systems. Frequent algal blooms, identified by elevated chlorophyll concentrations in the water, diminish the aesthetic and recreational value of coastal waters and may produce toxins. When coupled with hypoxia, or severe oxygen depletion, these toxins can cause fish kills and habitat loss — and may be dangerous to people. 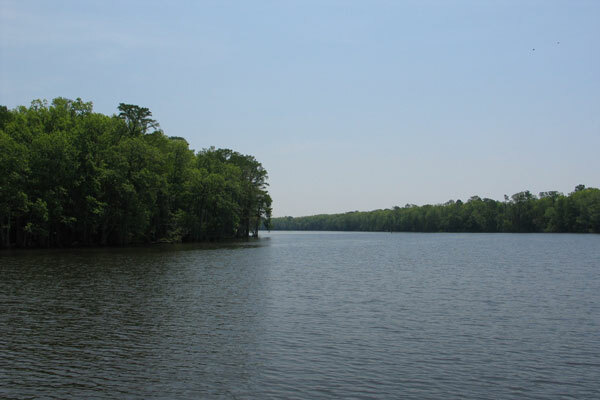 The Neuse River Estuary is a critical fisheries and wildlife habitat. Therefore, reducing nutrient loading and improving water quality is an important environmental and societal goal. I am part of a multi-institution team studying links among nutrient loading, climate, phytoplankton and dissolved oxygen. This North Carolina Sea Grant-funded study is being led by Daniel Obenour, who is a faculty member of North Carolina State University’s Department of Civil, Construction, and Environmental Engineering. He is collaborating with Hans Paerl and Ben Peierls, who study aquatic ecosystems at the University of North Carolina at Chapel Hill’s Institute of Marine Sciences. We are using data collected from the Neuse River Estuary over the last two decades to model the estuary. This research will test whether the assumptions and processes used in previous studies, some of which were funded by Sea Grant, are consistent with the variability observed in the estuary in recent years. The team is focusing on two water-quality parameters — bottom dissolved oxygen, or DO, and chlorophyll a as a proxy for surface phytoplankton concentrations — to analyze the current state of the estuary and its transformation over time, based on existing data. 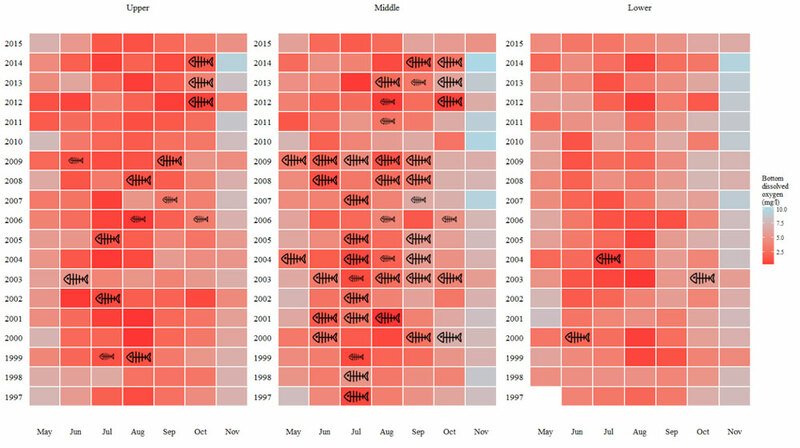 Surface chlorophyll a concentrations — that can indicate algal blooms — for May through November in the upper, middle and lower estuary segments from 1997 to 2015. Intense green indicates high surface chlorophyll a concentration. Big fish icons stand for a fish kill event with more than 5,000 dead fishes, while small icons show cases with less than 5,000 dead fishes. Click image to enlarge. Bottom dissolved oxygen concentrations for May through November in the upper, middle and lower estuary segments from 1997 to 2015. Intense red color indicates low bottom DO concentration. Big fish icons stand for a fish kill event with more than 5,000 dead fishes, while small icons show cases with less than 5,000 dead fishes. Click image to enlarge. There are large year-to-year fluctuations in bottom DO and surface chlorophyll a, making it challenging to identify significant long-term trends from the raw data alone. Nevertheless, the data suggest that surface chlorophyll a concentrations — that can indicate algal blooms — are rising over time, particularly in the autumn. The data also indicate that bottom DO in the upper Neuse River Estuary has been decreasing over time, while bottom DO data for the middle and lower estuary indicate no clear trend. A large fraction of fish kills takes place in the middle part of the estuary during the summer months. In some cases, these events may be explained as a consequence of low concentrations of measured DO. In other cases, algal blooms, which can produce harmful toxins and rapid DO fluctuations, may be partly to blame. 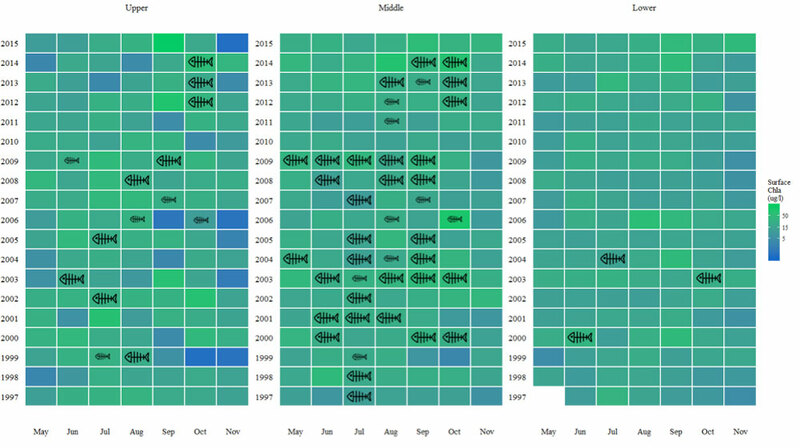 However, some fish kill events remain unexplained by the available data. We will continue to analyze the datasets to understand what is going on in the estuary. One of the project’s goals is to develop annual hypoxia and algal bloom forecasts in order to raise public awareness of estuary health, provide fisheries management with advanced warning of severe hypoxic episodes, and provide continuous feedback to inform adaptive watershed management. In addition, long-term, scenario-based forecasts will help inform future watershed management policies. This project addresses Sea Grant’s priorities of using sound scientific information to support ecosystem-based management, and to predict hypoxic/anoxic conditions in coastal waters. The methods developed here will be transferable to other estuaries in North Carolina and beyond. Stay tuned for additional updates on our research. Alexey Katin is a doctoral student in civil engineering focusing on water resources at North Carolina State University. This is one of nine North Carolina Sea Grant-funded core projects that will run through early 2018.